Preheat oven to 350°F for shiny metal or glass pan or 325°F for dark or non-stick pan. Place paper baking cups in two 12-cup cupcake tins and set aside. In a large bowl or bowl of a stand mixer, beat cake mix, water, oil and eggs on low speed 30 seconds, then increase speed to medium and beat 2 minutes. 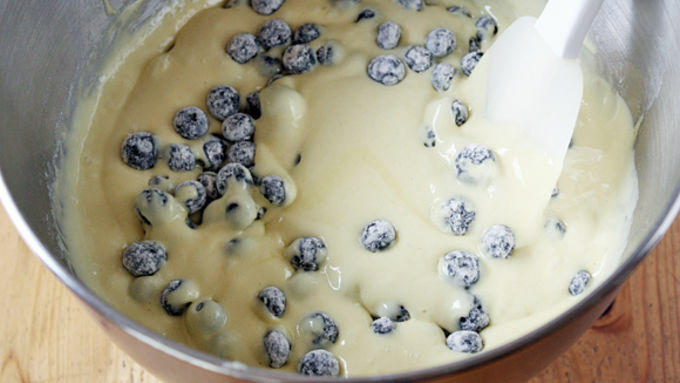 Toss blueberries with flour and fold into batter. Divide batter among paper baking cups (each cup should be about 2/3 full). 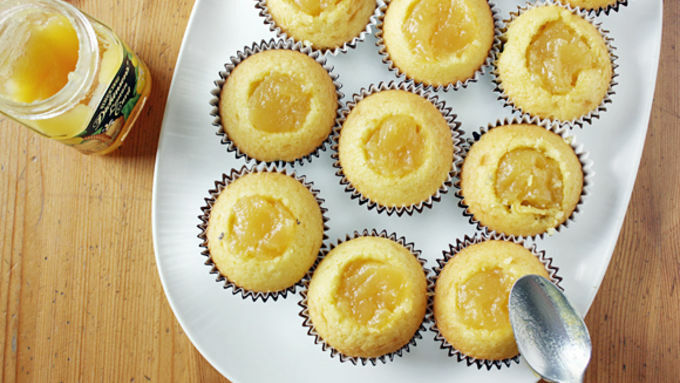 Bake cupcakes until a toothpick inserted in the center comes out clean, about 15-20 minutes. Remove from oven and set on a cooling rack to cool 10 minutes, then remove from pan and allow to cool completely. 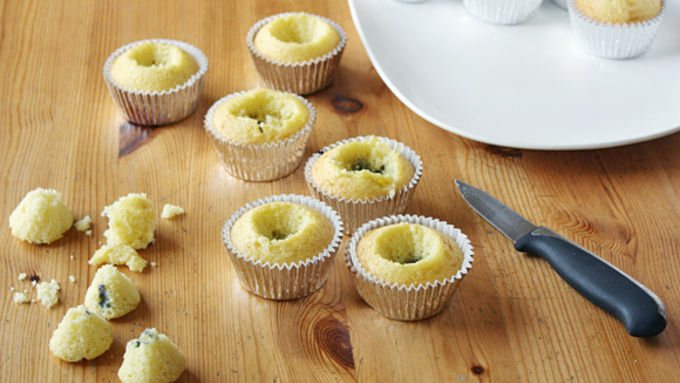 Using a sharp paring knife, cut out a 1-inch wide by 1-inch deep hole in the top center of each fully cooled cupcake. Discard the centers. Fill each hole to the top with lemon curd. To make the frosting: In a large bowl or bowl of a stand mixer, beat together cream cheese and butter until soft and fluffy, about 1 minute. Add powdered sugar and stir to combine. Zest one lemon in a separate small bowl and reserve; cut lemon in half and add juice to frosting mixture. Stir to combine. Frost cupcakes and top with reserved lemon zest and blueberries. Once upon a time, there was a girl who made cupcakes. Lemon Blueberry Cupcakes, to be exact. Lemon Blueberry Cupcakes filled with lemon curd, to be even more exact. 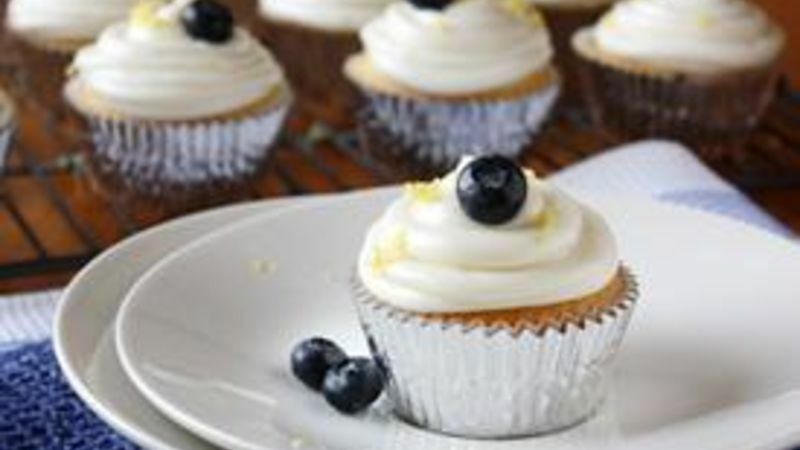 Lemon Blueberry Cupcakes filled with lemon curd and topped with a lemony cream cheese frosting, to be the most exact. And she was the happiest girl in all the land. The end. Neat story, huh? While I might need to work on my storytelling chops a bit, these cupcakes are flavor perfection. I mean it. No tweaking, fiddling, fussing or fudging (unless there’s actually fudge involved) necessary. Everything is in its right place – and it’s all thanks to the magical pairing that is lemon and blueberry. 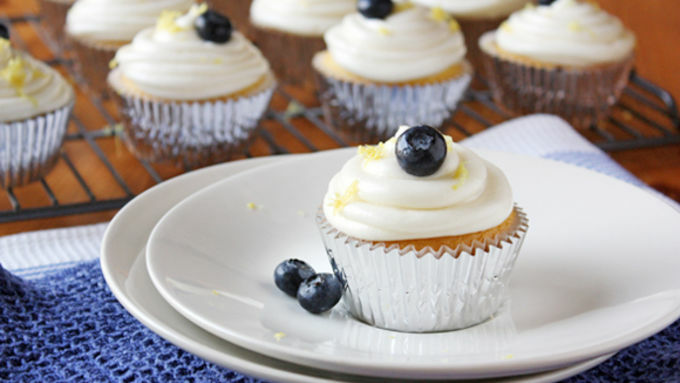 I mean, what could be better than fresh blueberries folded into fluffy lemon cupcakes with tart lemon curd-filled centers and a creamy, sweet and tangy frosting all on top? I’ll tell you what – not much. This is no fairy tale, friends – this is happening, right here, right now. If you can’t find fresh blueberries (which shouldn’t be a problem in the summertime), you can use frozen and thawed ones. Bask in the lemony, blueberry flavors of these bites of sunshine. We can all live happily ever after now.